Magnolia Pictures has released a wonderful new trailer for writer/director Richard Ayoade’s (Submarine) new film The Double. The story centers on meek office-drone Simon James (Jesse Eisenberg) who is overlooked by everyone he knows including his crush, Hannah (Mia Wasikowska). Simon’s meager life is then upended when he meets James Simon (Jesse Eisenberg), a man who’s identical in appearance and the complete opposite in personality. This trailer is, quite simply, fantastic, as it highlights Ayoade’s delightfully inventive script, Eisenberg’s stellar dual performances, and the film’s darkly humorous tone. The film received a wildly positive response at the Toronto International Film Festival (read Matt’s review here), and I can’t wait to check it out for myself in a couple of months. Hit the jump to watch the new U.S. trailer. The film also stars Wallace Shawn, Yasmin Paige, Noah Taylor, James Fox, Cathy Moriarty, Chris O’Dowd, Sally Hawkins, Craig Roberts, and Paddy Considine. 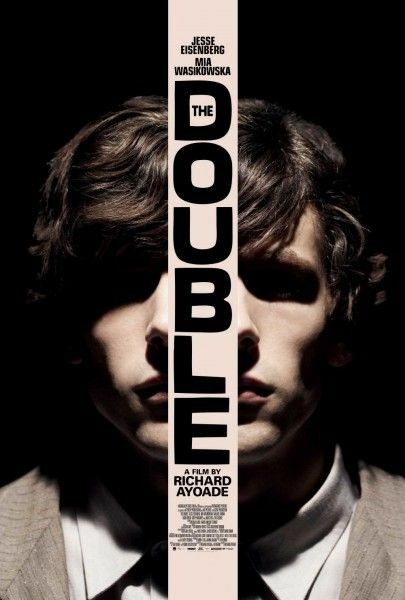 The Double will be available VOD and in theaters on May 9th. Simon is a timid man, scratching out an isolated existence in an indifferent world. He is overlooked at work, scorned by his mother, and ignored by the woman of his dreams. He feels powerless to change any of these things. The arrival of a new co-worker, James, serves to upset the balance. James is both Simon’s exact physical double and his opposite – confident, charismatic and good with women. To Simon’s horror, James slowly starts taking over his life.